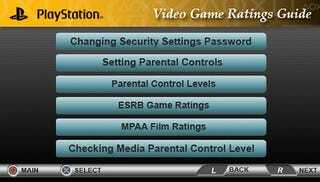 The only way parents could possibly miss the ESRB Video Game Ratings Guide loaded onto the new PSPgo is if they never actually touch the system themselves, and what are the chances of that? ESRB president Patricia Vance discusses the PSPgo's built-in ESRB ratings guide over at the PlayStation Blog, praising it as a "straight-forward and thorough overview of the ESRB rating system as well as a step-by-step walkthrough of the device's parental control features and settings." The guide includes easy-to-understand definitions of the standard game ratings, helping parents to setup the parental control levels on their children's shiny new handheld. It looks like an extremely useful tool that should be very helpful to the sort of parent who pays attention to things like game ratings and has the foresight to check out the device themselves before handing it over to their child. I'm pretty sure people like that do exist.